That's a wrap from us. Read the match report here as Arsenal go back into the top four. And we shall see you all on Tuesday for both Premier League and Champions League action. Arsenal boss Unai Emery, speaking to Sky Sports: "We can control better the match. It was very important to have one player more on the pitch to break the lines and attack the last third better. We didn't score the second goal with two good chances. They had some action in attack and giving us some struggles in defence. It is very positive to get the three points. Unai Emery on BBC Sport: "We were competitive today but in the circumstances we can control the match better. We didn't make it easy to score the second goal. We did not control the ball in the attacking third. Watford boss Javi Gracia, speaking to Sky Sports: "I only have one feeling. Today I am very proud of my players. We did everything to win. We showed our ambition and character. We tried to create chances, playing with 10 players. We had our chances. It was a good performance. But we have played a lot of time with 10. "I respect the referee's decision, but I don't agree (on Deeney's red card). In my opinion it is a yellow card but never a red. I can't explain what the referee saw to make that decision. It was an important one. I prefer to speak about my players who today deserve the recognition. We don't get points but we had a good performance and we keep playing with the same ambition and desire. "We tried to keep being compact in the middle with two lines of four and Andre up front. In all the different moments of the game we were compact and defending well and looking for chances. "Ben Foster and all the players deserve credit. Without exception they are very good players with high commitment. We are in this position to achieve seventh because of them." 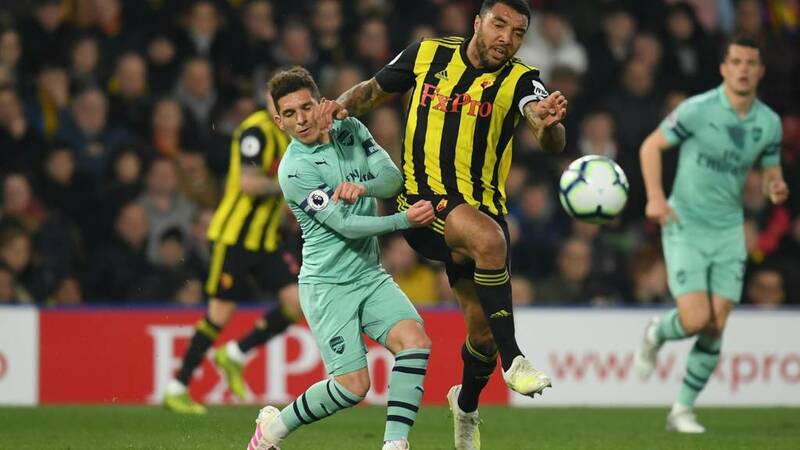 Watford manager Javi Gracia to BBC Sport: "We did a lot of things to try to win, a big effort. We played a lot of time with 10 players and we deserve the recognition. We didn't get any points but we played a good performance. It was a difficult game with 10 men. Get rid!Image caption: Get rid! Watford goalkeeper Ben Foster, speaking to Sky Sports: "I am gutted for the lads. they were brilliant. We were the better team, pushing for it. Arsenal were happy to hit us on the counter." On his error: "I should have just Cruyffed him to be honest. I've said sorry to the lads. I have tried to drag it on to my left and pass it out but before I knew it he (Aubameyang) was bloody on me. He is too quick. I have to do it quicker. In hindsight you have to get rid as quick as you can, even if it goes into row Z. On Deeney's red card: "I don't think any of us saw. Troy is not happy with it and he says it was nothing and he didn't mean to do anything. Stuff like that happens in football. You win and lose as a team." Ben Foster is always good value, fronting up straight away and admitting that he was at fault for the goal. The best team lost. It is a huge three points for Arsenal. They didn't get the performance but they got the result. A terrible error from Ben Foster and then big, bad Troy Deeney, who threw an arm and saw red. Watford had chances but didn't take them and they will feel hard done by. At this stage of the season it is all about results, but Arsenal didn't deserve this. They play like this on Thursday and they are going out of the Europa League. Watford were wasteful up top. How will that top six look at the end of the season - which is perilously close? There were a couple of big moments for Andre Gray, up until the egde of the area Watford were excellent. They just lack that bit of final quality. The officials are booed and whistled off as Laurent Koscielny and Etienne Capoue share a few jokes on halfway. I get this isn't our finest performance but aren't good campaigns built on getting results when you don't play well? After this rubbish tonight, we're not getting top 4. I think Napoli might even turn us over. How are we so different at home??? BIG win for Arsenal who go fourth! A first clean sheet on the road all season. Watford lose but are applauded richly off. They were very very good. If Troy Deeney was on the pitch for 90 minutes here, 11 v 11, Watford would win this game. Arsenal have been feeble. Isaac Success makes a poor decision at the back post and one chance has gone. Time for any more?